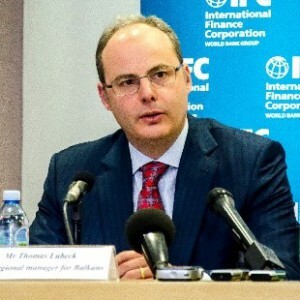 Thomas E. Lubeck is the Regional Manager for Central Europe and Western Balkans at IFC. In this capacity, he oversees IFC activity in 15 IFC member countries including strategy, business and partnership development. He has two decades of successful investing in emerging markets in Southern and Eastern Europe and South Asia. He led innovative projects in capital market development, renewable energy infrastructure and anti-crisis investing in the financial sector. A U.S. national, Mr. Lubeck has held several leadership positions within IFC. Previously, he served as the Regional Manager for the South Caucasus during which time he oversaw a significant expansion of IFC investment and advisory activity. Under his leadership IFC supported renewable energy, agribusiness and the banking sector which was hard hit by regional conflicts and the global financial crisis. IFC also helped the South Caucasus countries significantly improve their investment environments through IFC’s advisory services. Mr. Lubeck joined IFC in 1997 as an investment analyst and has since worked in Southern Europe, Latin America and South Asia. He holds a Masters in Accountancy from George Washington University in Washington, DC .